Kravis Prize recipients are bold, visionary leaders that have impacted more than 700 million people in 100 countries around the world. They demonstrate exceptional leadership and management principles that allow them and their organizations to achieve extraordinary impact. We encourage you to deepen your understanding of the Kravis Prize by exploring the following resources and joining the Kravis Prize community. Read case studies detailing the impact and bold, visionary leadership of Kravis Prize recipients, published in the Stanford Social Innovation Review, and authored by Kravis Prize Executive Director, Kim Jonker and William F. Meehan III of Stanford University’s Graduate School of Business. Follow the Kravis Prize blog where we highlight Kravis Prize news and events while celebrating milestones and achievements of past Kravis Prize recipients as they continue to innovate in the nonprofit sector. 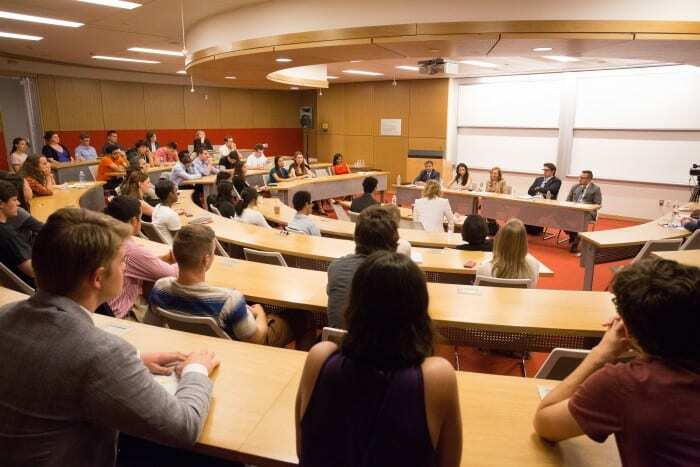 Engage with Kravis Prize recipients on a deeper level through CMC sponsored summer internships, year-round academic internships, and capacity building retreats where we invite Kravis Prize recipients to return to CMC’s campus in Southern California throughout the year. We aim to foster a rich dialogue between these global changemakers and CMC’s student body as we all work to define what truly constitutes a bold, visionary leader.